Czech goal ace has other offers but will 'never say never' to another year at Tynecastle. 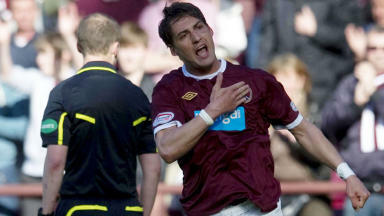 Rudi Skacel has denied reports that he will not be returning to Hearts next season. The Czech ace said he is waiting on talks with the club but has other options on the table as he seeks a new challenge in his career. Hearts have said the club would like to keep Skacel but said that the finances would have to suit the club, which is cutting costs following financial difficulties in the last campaign. The Tynecastle favourite bagged a double in Hearts’ 5-1 Scottish Cup victory over Hibernian in May to end the season as the club’s top scorer but no deal has been discussed with the Hearts board since his contract ran out after the Hampden finale. Speaking to the Edinburgh Evening News, Skacel said: “For me, it’s important to find a new challenge because the whole package has to be right. I want to play for something. I felt very well the last two years and I need a new challenge, so I want to see what will happen. “I cannot be at Hearts for the rest of my life. I have to take care of myself and make the best move for my career. Like I said, I want some challenges and I want to play for something. “I will see who gives me the best offer at this time. I have a few things going on and I’ve had a few talks with a few people. Nothing is concrete and I will decide in the next few weeks what will be the best option for me. I want to make the right decision for myself. After fans reacted to his comments on Twitter, Skacel tweeted to say that he was not ruling out a return to the capital side yet. Following the quotes being published, a spokesman for Hearts said that Skacel was "a great ambassador for the club" and confirmed Hearts were interested in keeping him. The spokesman added: "The financial climate however has changed for most clubs in recent seasons and any agreement that could be reached would need to suit both Rudi and the club for it to be truly mutually beneficial. "We would not rule anything out at this stage but whatever we do will have to give due consideration to the current financial uncertainty in football in Scotland and elsewhere at present."